Dwarf Yaupon Holly – Dwarf, evergreen shrub with tight branches that create a spreading mound excellent for low hedges, borders, or around foundations. A tough plant that tolerates a range of soils conditions and can withstand drought or flooding. Red Yucca – Tall spikes hold deep rose-pink flowers almost year-round atop green drought tolerant foliage; effective plant for rock garden, landscape accent, or in containers. An evergreen perennial, best used with other desert-like plants. Dwarf Palmetto – A hardy Palm that grows in a clumping arrangement, with most of the trunk underground. Flower clusters and fruit rise above the leaves and may bend to the ground. A fine subject for containers and mass plantings. Agarita – is a rounded shrub with beautiful gray-green, holly-like foliage and clusters of fragrant yellow flowers from February through April. 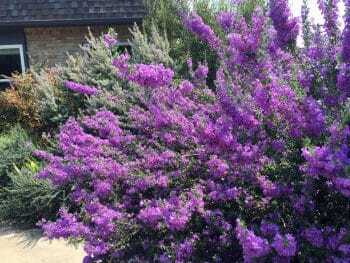 Central Texas sage – Texas sage is also known as, purple sage, Texas ranger, and many other common names. Cenizo is extremely drought tough and needs very little water once established. In fact, this shrub does not like ‘wet feet,’ so be very careful if planting in clay soils. Cherry Laurel – Cherry Laurel is a large evergreen shrub or small tree with dark glossy green leaves. It grows in deep, moist but well-drained bottomlands in southeast Texas. Possumhaw – Vigorous, upright deciduous shrub with small, lustrous green leaves. Profuse, scarlet-red berries are excellent for adding refreshing color to the winter landscape. One of the last cultivars to drop its leaves in fall. Texas Palmetto – A large, water-loving palm with fan-shaped leaves native to Texas and Mexico. It is cold hardy to below 10 °F and very adaptable to a variety of different climates. Texas Persimmon – Texas Persimmon is one of Texas’s premier small trees. The bark of mature trees peels away to reveal shades of gray, white and pink on the trunk underneath. Newly planted shrubs should be watered frequently until they are well rooted, which may take two growing seasons. Once established, plants should be watered less frequently so they will develop deep roots and be better able to withstand drought. They can be cool, green landscapes full of beautiful plants maintained with water-efficient practices. When planning your landscape, using native Texas shrubs and trees is a smart choice to insure your landscape will be drought and heat tolerant. Should you find yourself in need for a professional’s landscaping touch, please give Ryno Lawn Care a call for a free estimate.